Over at MTV, blogger Adam Rosenberg had the great idea to do a scene by scene rundown of the Alice Teaser Trailer. This appealed to my OCD and so I couldn't help myself. I had to do the same but different. Shot 1: Alice running through a garden, no doubt following a rabbit who may or may not be talking to himself about a very serious date and consulting a watch. Shot 2: Alice leaning over a hole, and just between you and me, it really looks like she forced that twig to snap. Shot 3: Alice goes head over heels and into the hole. Shot 4: In case you didn't know, this is a Tim Burton film. Shot 5: Down and down and down falls Alice. Readers of the original will remember quite a bit of exposition on the part of Alice during her fall. She expected the Antipathies. We are treated with lanterns, furniture, windows, cabinets, paintings, and barrels. Some careful scrubbing reveals a skull whizzing by. No ORANGE MARMALADE here. Shot 5: We see Alice falling face first, and it looks like she's very tired. Shot 6: Alice hits the ground. In the book this involved a heap of dry sticks and leaves, which I'm sure she would have preferred over a tile floor. Shot 7: Alice blacks out and when she comes to, she's in a bathtub packed with ice clutching a note about how someone just stole her kidneys. NO NO that's not what happens. Alice comes to in a room with a tiny door and a bottle. We can't see it, but I bet the bottle says "Drink Me". Shot 8: Alice drinks. She is no doubt experiencing deja vu. Shot 9: Alice sets down the bottle and shrinks. There is a key in view on the table. Seeing as how her dress did not shrink with her, hopefully there is something nearby with a "wear me" sign on it. Shot 10: Alice wandering around in front of the garden shown in some of the concept art panoramas. This is the place with the chatty flowers in front of the topiary garden. We see a flamingo topiary bird to the right. Alice has some serious decolletage now. Shot 11: Alice walking through a giant mushroom forest with several friends. Tweedledee and Tweedledum, the Dodo, the White Rabbit, and is that the dormouse running ahead? Shot 12: Alice and the White Queen on a balcony of a huge castle overlooking a chasm. They are standing next to a telescope. The White Queen looks a little like she's dancing. I keep pushing this out of my mind because it's too horrible to dwell on, but somehow the White Queen looks like Ali G here. Not a good look on her. 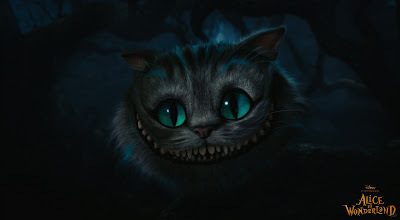 Shot 13: Twisty trees and the Cheshire Cat, appearing in head-only form, with a nice toothy smile. Nice gratuitous CGI iris action on the eyes after a blink. Shot 14: Panning shot of Crispin Glover (!) as the Knave of Hearts, looking at what is presumably a map. Shot 15: Helena Bonham Carter as the Red Queen, throwing open some doors. The people inside, behind her are kind of grotesque. There is a man with an enormous forehead, a woman with three chins, a woman with huge ears, and a man who looks a little normal. She looks mad. Shot 16: Whew! This is a lot of work. We have here a monster with black spots and a bunch of cool CGI red card soldiers. The monster roars. Shot 17: It looks like Alice got a face full of roar, although I doubt that's really it. There is wind gusting in her face. THAT's confusing. Shot 18: Alice is talking to Tweetledum and Tweedledee. An enormous bird swoops down and takes off with them. Alice ducks and then turns to watch them go. Shot 19: Some frog pages open the same doors we just saw the Red Queen open. It looks like the Mad Hatter is walking out with card soldiers behind him. On the left is a mural of a gryphon, and on the right, the Jabberwock. There is someone riding the Jabberwock. Shot 20: The Mad Hatter's hat is on the ground. Johnny Depp as the Mad Hatter bends down to pick it up, and we get full-on shot of the Mad Hatter. LOOK-ENG GOOD. Shot 21: In case you didn't know this was Johnny Depp, they're going to show you his name. Shot 23: Confront Alice, who is still small from drinking the shrinking potion. Shot 24: The Mad Hatter tells Alice she is terribly late and calls her naughty. *groan* Behind him is what looks like a derelict windmill. Shot 25: The Mad Hatter throws his hat and we see the next few things from the interior of his hat. Shot 27: The Mad Hatter, laughing. Shot 30: It's not really its own shot but I make the rules around here. The zeroes of 2010 turn into Cheshire Cat eyes and we are treated to his toothy smile again. Shot 31: Whew last one. The Mad Hatter unfurling two rolls of fabric by throwing them at the camera. Out shoot letters. Shot 32: "Go through the looking glass in Disney Digital 3D IMAX 3D in select theaters" Then more writing. Credits. Danny Elfman. I'm not typing all this go watch it yourself to see the end.